Homestead has a special place in my heart. I first moved to the Miami area in 1992, a few weeks after Hurricane Andrew came to town. Homestead is located about 35 miles southwest of Miami, and is in the middle of a unique agricultural area called the Redland. The Everglades begins just west of the city. Key Largo is 25 miles south on U.S. Highway 1. It is home to about 30,000 people. The name came about when the Florida East Coast Railway was being extended from Miami to Key West. The railroad passed through the area around the Redlands that had recently been opened up for homesteading. Since the construction camp at the end of the railroad had no real name, materials were delivered to "Homestead Country". That got shortened to Homestead, and the name stuck. My firm had a branch office at the corner of Krome Avenue and Mowry Drive in downtown Homestead. It was one of the few buildings in Homestead that was still habitable after the Category 5 hurricane raged through south Florida. The building became one of the offices for the "We Will Rebuild" team that was assembled to help direct the redevelopment of south Miami-Dade County. The team was comprised of powerful community leaders assembled in part by the late Alvah Chapman, former president of the Miami Herald. Homestead had thousands of mobile homes, most inhabited by Hispanic farm workers, that were destroyed by the hurricane. Many thousands of people were homeless, and temporary camps were built all around the area by FEMA. Many of the old Homestead buildings were gone forever, and a lot of people actually thought that the town would cease to exist. The town seemed destined to disappear into the dustbin of history. 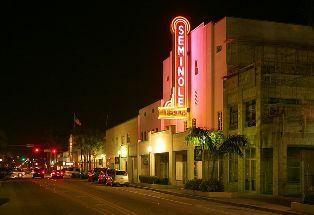 The town was first incorporated in 1913, and is the second oldest city in Miami-Dade County after the City of Miami. 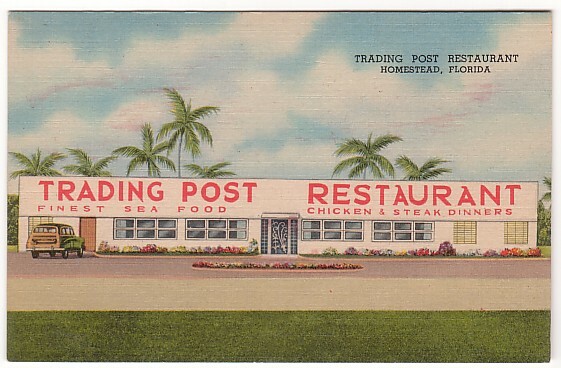 Homestead, Florida grew slowly after 1913, primarily as a supply town for the surrounding farms. It was never fancy, but since Andrew's visit the town has been rediscovered. The nearby Villages of Homestead is a large residential development that has seen tremendous growth since 1992. Many other developments have sprouted up in the area because of the scarcity of land nearer to Miami. Downtown Homestead has a nice gentrified feel to it. There are plenty of good restaurants in the area. Some of the best Mexican food in Florida can be found in Homestead. Those of us who saw Homestead in the immediate days after Hurricane Andrew are still amazed at the miraculous rebirth of this little city. When you are traveling to the Florida Keys down U.S. Highway 1, there are only two ways to get there: the 18 mile stretch and Card Sound Road. 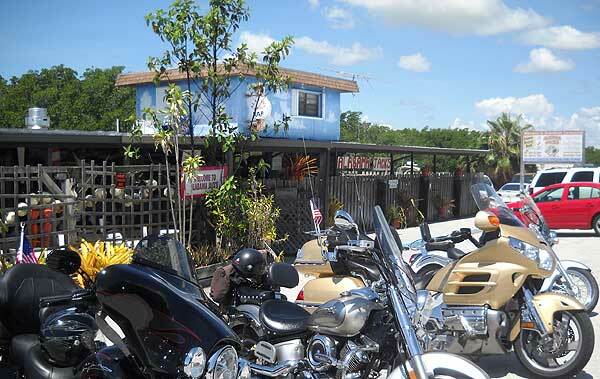 After leaving Homestead, the 18 mile stretch carries you down to Jewfish Creek and Key Largo. A longer route is to turn left on Card Sound Road after leaving Homestead. This will take you through mangrove swamps to a toll bridge that crosses Card Sound and the Intracoastal Waterway onto north Key Largo. Alabama Jack's is located on the right side of the road just before the toll booth. You can't miss it in this sparsely populated area of South Florida. If you see dozens of motorcycles parked in front, don't be intimidated. These are not Hell's Angels or outlaws looking for a fight, but just regular folks enjoying the laid back ambience of one of the most unique places in this part of the state. Don't be surprised if you see Granny clog dancing with a biker. It's that kind of eclectic place. There is a nice bar inside, and plenty of seating both inside and outside. 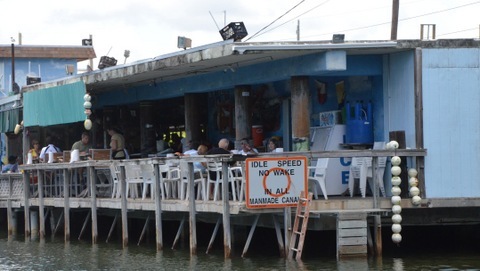 They have good seafood, including grouper sandwiches, grilled dolphin platter, crab cake sandwiches and conch fritters. I really like their conch fritters. For the non-seafood lovers they have hamburgers, chicken fingers, salads, buffalo wings and french fries. The food is good but not great. You don't go here for the food as much as for the experience. If you are a conch fritter fan, you will find the ones at Alabama Jack's to be a bit different. They are not the little round doughy balls you see in other restaurants, but look more like pancakes. They are loaded with conch and some kind of secret seasoning that gives the fritters a sort of tropical taste. The full service bar serves great margaritas and there are lots of beer, wine and hard liquor choices you can make. They quite often have live music, much of it in the Jimmy Buffett style. Two cautionary notes about Alabama Jack's: this place is in a swamp, and bugs love this kind of environment, especially mosquitoes. Give yourself a break and lather up with a good mosquito repellent just in case you are visiting during one of those times when the little bloodsuckers are very active. The other thing is that some people have reported vehicle break ins, especially on busy weekends. Keep valuables out of sight and the car tightly locked. It has never been a problem for me, but I'm careful anyway. The place closes at 700pm, so I recommend going in the early afternoon, just after the normal lunch hour. I also recommend going during the week to avoid the weekend crowds.